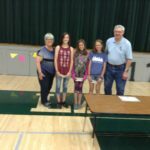 The annual essay contest sponsored by the Forest County Association of Lakes (FCAL) was again very well done by the fifth and sixth graders in Crandon, Laona and Wabeno. This year’s topic was “My Favorite Memory on a Forest County Lake”. The Wabeno students wrote 46 essays, the Crandon students wrote 38 and Laona submitted 29 student essays. The essays were judged by eleven FCAL members. The essays were so well written that it was difficult to determine the winners. The students were competing for $100 first place prize, $50 second place and $25 third place which were awarded at each school. The prizes were awarded at the end of year assemblies held at each school. 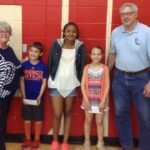 The winners of the essay contest at Crandon were: Bryce Marshall, first place: Bella Toyebo, second place; Alexis Schallock, third place. Laona winners were: Grace Krawze, first place; Marissa McLaughlin, second place; and Kaylyn LaRock in third place. Wabeno winners were: Brian Sears, first; Nathan Shepard, second; and Ryan Roy, third. The winning essays from all of the schools will be on display at the Crandon Public Library from now until the annual Kentuck Day on July 29, 2017. On Kentuck Day, the essays will be on display at the FCAL both. The winners of the essay contest and their parents will be invited to be honored guests at FCAL’s annual meeting and banquet which is scheduled for October 21st at TBob’s in Laona. The essay winners will then be asked to read their essays as part of the program at this event. FCAL would like to express their appreciation to all of the schools for allowing them to run this annual essay contest. Wabeno FCAL essay contest prizes awarded by Harry Resch and Pam Schroeder. Winners from left to right are: Brian Sears, 1st place, Nathan Shepard, 2nd place and Ryan Roy, 3rd place. Laona’s essay contest winners awarded by Pam Schroeder, FCAL President, and Harry Resch, FCAL contest organizer. Winners from left to right: Grace Krawze, 1st place, Marissa McLaughlin, 2nd place and Kaylyn LaRock, 3rd place. 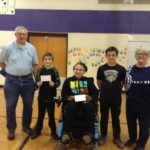 Pam Schroeder, FCAL President, Bryce Marshall, Crandon 1st place, Bella Toyebo, 2nd place, Allexis Shallock, 3rd place, Harold Resch, FCAL essay contest organizer.